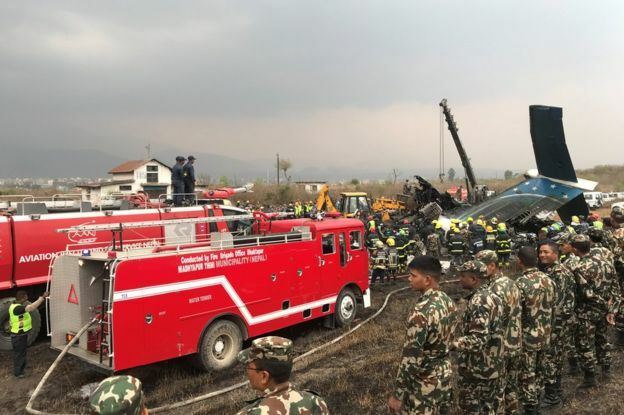 A Bombardier Dash 8 Q400 carrying 71 passengers and crew has crashed whilst landing at Nepal's Kathmandu airport, killing 49 people, according to police. Rescuers raced to the scene and pulled bodies from the charred wreckage of the aircraft as a row has broken out between the airport and the airline. The airline US-Bangla, from Bangladesh, has blamed air traffic control, however, according to reports, the airport claims the aircraft approached the airfield from the wrong direction. 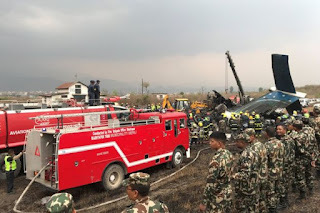 The exact cause of the crash remains unclear, however, Nepalese Prime Minister KP Sharma Oli promised an immediate investigation. A recording of a conversation between air traffic control and the pilot shortly before the plane crashed seems to indicate some misunderstandings over which end of the runway the flight was cleared for landing on. Moments before the plane crash-landed, an air traffic controller is heard in the recording leaked to the media by air traffic control, telling the pilot: "I say again, turn!" According to local media, the Director General of the Nepalese Air Traffic Control, Sanjiv Gautam said "The aircraft was permitted to land from the southern side of the runway flying over Koteshwor, but it landed from the northern side,"
"We are yet to ascertain the reason behind the unusual landing." However, Imran Asif, chief executive of US-Bangla Airlines firmly blamed Kathmandu air traffic control. "There were wrong directions from the tower. Our pilot was not at fault," adding, "Our pilot is an instructor of this Bombardier aircraft. His flight hours are over 5,000. There was a fumble from the control tower." From initial reports, it appears that the aircraft struck an airport perimeter fence before impacting with the ground. Twenty-two people are being treated in hospital for injuries according to police spokesperson Manoj Neupane. The aircraft was operating a flight the Bangladeshi capital Dhaka to Kathmandu. It is now known that 33 of the passengers were Nepalis, 32 were Bangladeshi, one was Chinese and one was from the Maldives. Many of the 22 people injured and described as being in a critical condition. This crash is the latest of a series of accidents in Nepal in recent times. 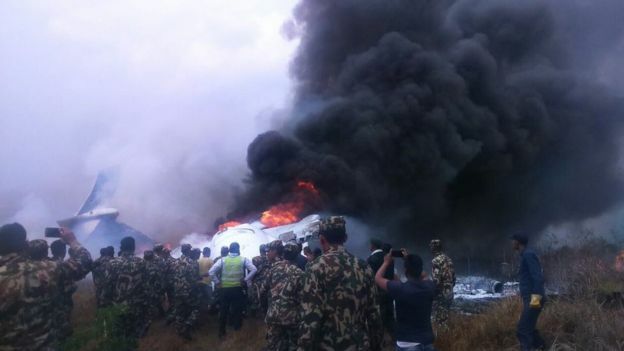 Twenty-three people killed when a small passenger plane crashed in mountainous western Nepal. Aircraft skids off Kathmandu's runway in fog - no fatalities. Bodies of all 18 people recovered after small plane crashes in western Nepal. Plane heading for Everest region crashes on the outskirts of Kathmandu, killing 19. Aircraft carrying Indian pilgrims crashes in northern Nepal, killing 15. WWF helicopter crashed in eastern Nepal, killing 24. Everyone at Bombardier is saddened by the tragic event involving the Q400 aircraft. We extend our sympathies to the families of those whose lives were lost in this accident, and our thoughts are with those who survived. Bombardier Air Safety Investigation Office is in contact with the authorities, and will provide assistance to all authorities as needed. The Q400 aircraft has been designed to be robust and reliable in consideration of the high cycle demand of regional airlines and was designed to comply or exceed all airworthiness certification requirements. The Q400 fleet has accumulated over 8.5 million flight hours, and has performed about 10 million takeoffs and landings to date. The Bombardier Q400 turboprop has been in service since 2000. Currently, there are over 500 Q400 aircraft in service worldwide, and the fleet dispatch reliability over the past year was consistently over 99.5%.